The skin is an extremely important and complex organ of the human body and it must be given the importance it deserves. The skin also contains vital organs and it must be looked after like any other internal organ of the body. The parts that we cover up have to be protected just as we protect the parts exposed to the sun, the air and the cold. Sweating is physiological, normal and necessary and should not be prevented. However, it should be eliminated for the skin to remain dry and free from excessive funguses and bacteria, as they cause unwanted odours. The soles of the feet are by far the part of the skin where the least evaporation of sweat takes place. The comfort, hygiene and – therefore – health of our feet depends directly on the ability to isolate and eliminate this sweat. This is why materials that come into contact with the skin must be very stable when faced with the effects of sweat to guarantee the best results. "Technology alone is not enough. We also have to put heart into it"
At Arneplant we provide solutions to common problems both for manufacturers when creating their products and for consumers when using these products. The studies into biomechanics that we carried out for the development of our insoles meant that we could achieve greater stability and sensitivity with each step and – as a result – a reduction in fatigue when walking. What’s more, we use new systems such as bactericides, water-based glues, joint systems, manufacturing processes, machinery, etc. which help foster healthy feet. At Arneplant we help keep your feet healthy. The foot comes into direct contact with the insole. This is because it is where the full weight of the body is taken when we walk. It is also where vapour and sweat build up, making the foot moist and harvesting odour-causing bacteria. The foot lives alongside a micro-climate within the shoe. The shoe and its outer materials isolate the foot and creat a closed space with little ventilation and often with high temperatures that speed up the sweating process. This is a “heaven” for moisture and bacteria. Arneplant creates insoles which absorb shocks while walking and act as a cushion to let your feet breathe. This is all thanks to its foams, fabrics and manufacturing processes that are all based around breathability. 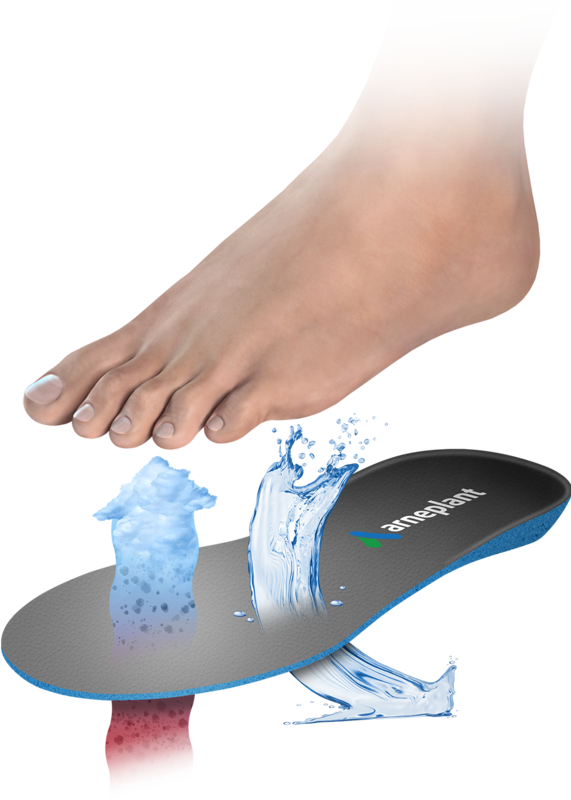 As a result, we produce insoles that keep your feet fresh, dry and odour-free. At Arneplant we are committed to developing highly efficient insoles, foams and microfibres to keep your feet healthy and comfortable. Arneplant has developed a union system capable of maintaining the breathability of materials and fibres. Our new manufacturing system involves not blocking the properties of the various materials in the insole when we join them together, thereby maintaining breathability all around. We use water-based glues, which encourage the circulation of air and the ideal breathability, ensuring greater comfort for our feet. State-of-the-art technology developed by Arneplant to successfully eliminate unwanted odours. Effective is the greatest advance in insole design in the past decade. It is an anti-odour treatment formed by catalysers with anti-bacterial agents that neutralise germs and eliminate odours. Arneplant works alongside Europe’s leading laboratories and research centres and easily meets the requirements set forth in the Section 5.7 of the ISO 20345:2011 standards, in accordance with the test method ISO 20344:2011. If you would like to work with us, please fill out the form and send us your CV.